Happy Cinco de Mayo! 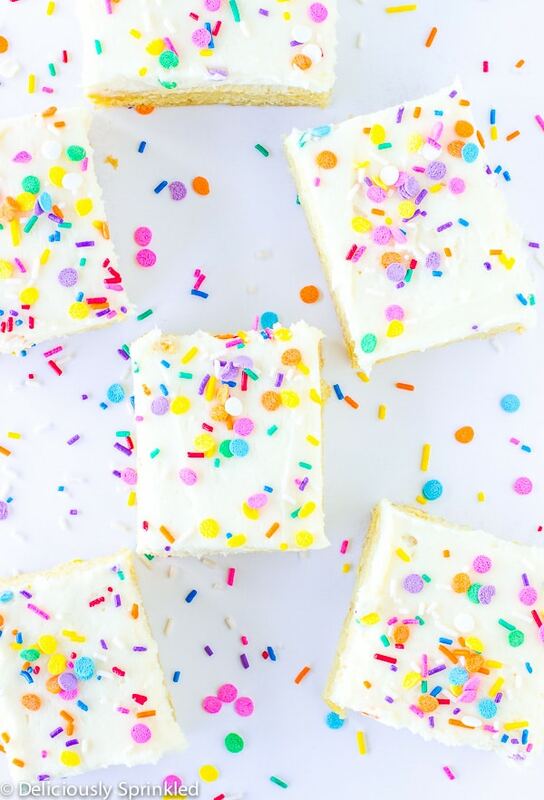 Your probably wondering why I’m not sharing a delicious guacamole dip to celebrate, and I wish I was but I’m just not that organized and I’ve been too excited to share these amazing Confetti Sugar Cookie Bars with Vanilla Frosting with SPRINKLES with all of you. And, SPRINKLES are always a perfect way to celebrate any occasion! 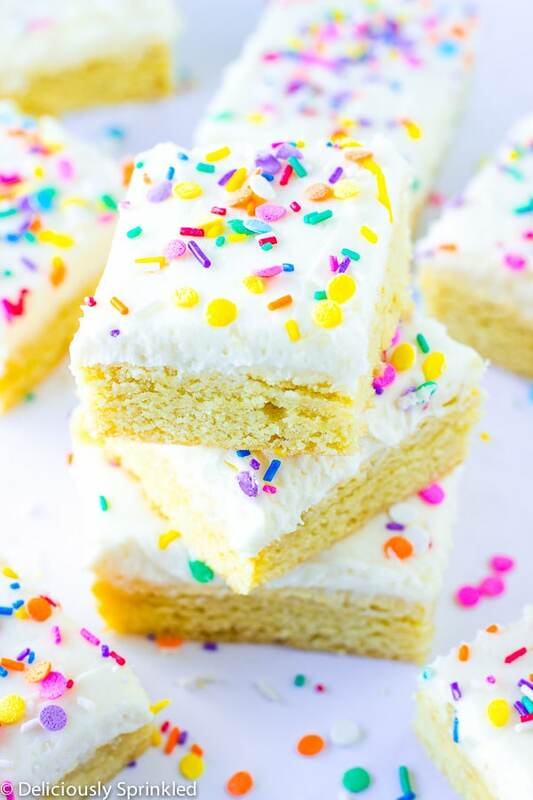 These easy to make Confetti Sugar Cookie Bars taste just like a frosted sugar cookie but they are almost better! These bars are perfect for a party when you need a quick dessert and you don’t have time to bake and frost a ton of sugar cookies. I make these sugar cookie bars all the time and they are always a huge hit. I like to top them off with my delicious vanilla buttercream frosting and SPRINKLES! I guarantee these will become one of your go-to desserts too! ✔ To make it super easy for you to cut these bars into squares, line your 9×9 inch baking pan with aluminum foil, leaving enough overhang on the sides and spray the foil with non-stick cooking spray. 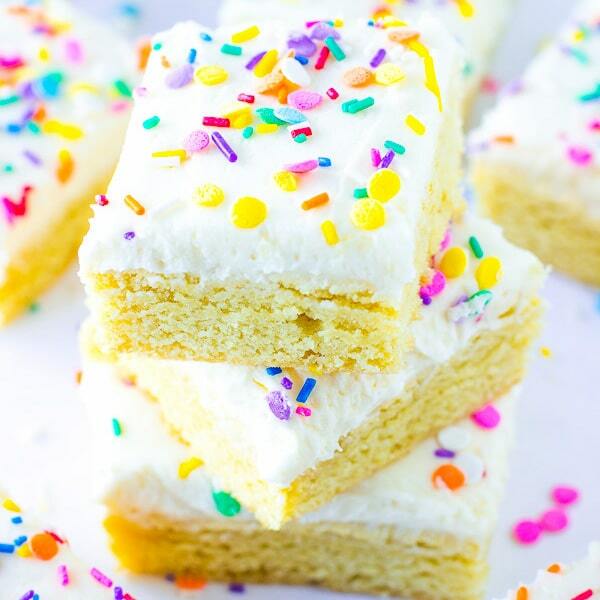 Once the confetti sugar cookie bars have cooled, frost the top of the bars and sprinkle with colored sprinkles, then lift the bars out of the pan, folding down the aluminum foil sides. Use a sharp knife to cut these bars into squares and enjoy! ✔ IMPORTANT: Do not over bake these bars. Over baking will result in a dry sugar cookie bar. ✔ I used my favorite Vanilla Buttercream Frosting, you can find my step-by-step photos on how to make my Vanilla Buttercream Frosting here. And if you need to buy SPRINKLES, I buy all my sprinkles in bulk here. PRE-STEP: Preheat oven to 375F degrees. Line a 9x9 inch baking pan with aluminum foil and spray with non-stick cooking spray. STEP 1: Using a hand mixer or a stand mixer, cream together the butter and sugar until light and fluffy. STEP 2: In a medium sized bowl, whisk together the flour, salt, and baking soda. Set aside. STEP 3: Add eggs to butter/sugar mixture, one at a time, mixing after each egg. STEP 4: Add vanilla extract and the dry ingredients. Mix until just combined, do not overmix. STEP 5: Press the sugar cookie dough into prepared pan. Bake for 15 minutes or until top of bars become LIGHTLY brown. Let cool completely before frosting. STEP 6: Using an electric or stand mixer, cream together butter and vanilla extract until light and fluffy. Beat for about 3 minutes. STEP7: Slowly, add powdered sugar and heavy whipping cream. Mix until frosting becomes light and fluffy. Beat in the pinch of salt. STEP 8: Frost cooled sugar cookie bars. Top with SPRINKLES. * Store bars covered in the fridge for up to 5 days. I love these! they are so pretty 😉 and sugar cookies are so delicious! yummm! These are SO cool! Just looking at them makes me smile!!! All the sprinkles! Loving all the funfetti action going on in these sugar cookie bars. Wish I had one now! I love the step by step details! These are gorgeous!